It would seem like destiny that a couple from Springfield, Oregon would epitomize what Spring means for so many...beautiful flowers and love in bloom. Virginia Jasmer and her husband, Fred, live in Springfield, across the river from the University of Oregon where they first met. Education was a vital part of Virginia's life. "I was a Speech and Language Specialist for a local school district," Virginia remarked. 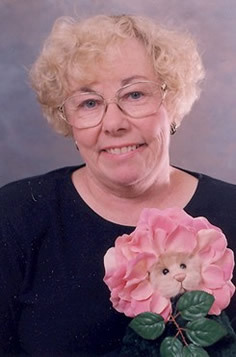 During the last ten years of her 30 year teaching career, she began creating teddy bears. 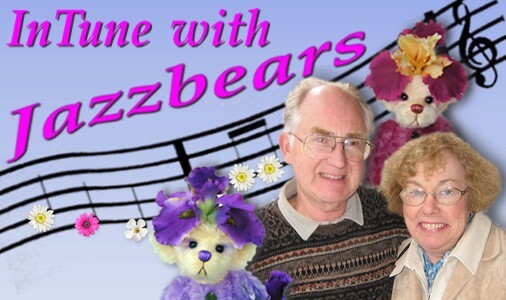 "We were both ready to take Jazzbears through the U.S. and abroad the moment we retired," she recalled. For the past 14 years, Virginia and Fred have been very involved in a most pleasurable partnership of life and business, "While I do most of the bear work, Fred does all the paperwork, errands, travel plans and tightening of joints." 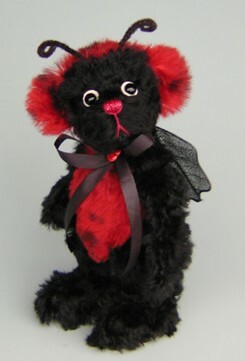 Virginia's passion for creating bears began in the early 1980's, when she bought a book on teddy bear making. She promptly set aside her quilting, needlework, knitting and clothing construction and has never looked back. "Actually, I was soon to discover how important all the needlework skills would be in creating teddy bears," she pointed out. 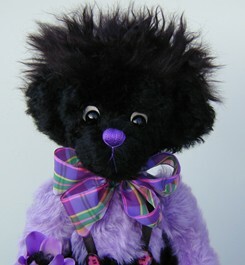 Currently, she and her husband are doing dozens of shows per year and selling bears shown on their web site. 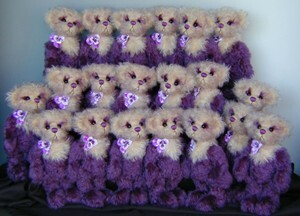 Last year, roughly 250 Jazzbears found new homes. 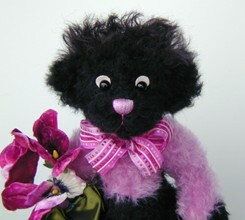 "My signature bears are definitely the flower bears." When asked how she started with that theme, Virginia began, "When our first grandchild was a year old, her mother and I decided we wanted to dress her as a flower for Halloween. 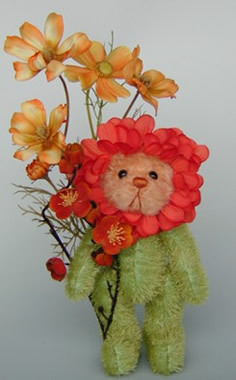 After finding some green pajamas, my part was to create the flower hood, which was a sunflower." "After finishing it," Virginia continued, my granddaughter wouldn't have anything to do with it until her mother plunked her down in front of a mirror. When Alexa saw her face, surrounded by those beautiful, large, yellow petals; she was delighted and then resisted taking it off after all the Halloween fun was over." 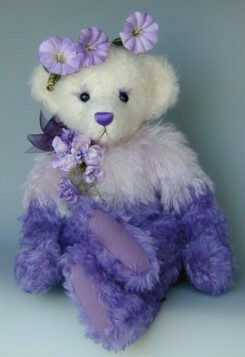 Virginia knew at that moment what she could do with the idea and has been creating the floral bears ever since. 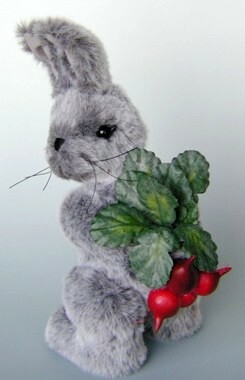 Drawing inspiration through language (a phrase or a name), from the names of fabric, items of embellishment or antique items that she finds, her work has transitioned through the years to include more realistic rabbits, Gollie Bears and the very distinctive flower bears. 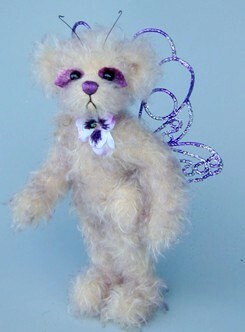 "I hear quite often that people recognize my bears immediate by their looks," she stated. Traveling with Fred, Virginia feels that they have really created a great retirement career, which lets them relax while creating, travel and especially, to meet new people. Often asked if they were musicians, as Jazzbears would seem to imply, the name was selected because of it's similarity to their last name of Jasmer. It also seems to fit into their harmonious relationship, which keeps them in tune with each other and their collectors.